Music Station On-Air Talent: Bank Tellers of the Music Biz? Carolyn was chatting recently with a neighbor who observed that she avoids using the supermarket self-checkout lane because she doesn’t want to put the checkers out of work. Of course, as Carolyn points out, that same neighbor uses ATM’s rather than going to the bank and uses Google to find phone numbers rather than calling directory assistance – other examples of automated solutions displacing workers. Forgive us the nostalgia of remembering the supermarket checkers and bank tellers of our parents’ and grandparents’ generations. Maybe you too remember being given a treat or your parent receiving advice or gossip or a wry joke from a checker or teller while the checker or teller dealt with the technology of the day – keying in the price of every item on a register or noting the bank transaction on an adding machine. Sound familiar? For decades DJ’s have played great music playlists while giving out community info, jokes, gossip and prizes while dealing with the current technology of the day to play the music. In this analogy, services like Pandora and Spotify are automated music delivery solutions (ones that have the potential to put more DJ’s out of work). In banking and grocery stores, these automated solutions offer convenience and time savings for consumers. In radio, the added value that DJ’s can bring to the listening experience should help counterbalance the greater commercial inventory stations carry compared to the new digital channels. But if people believe that stations are automated and inaccessible, these notions of friendly, familiar hosts fade away. In our twelfth and latest NuVoodoo Ratings Prospects Study around half the ratings-likely respondents in our sample of 3,049 persons 14-54 from all PPM markets across the country agree with the statement: “You know stations don’t really take requests because they never answer the phone, respond to email, texts or social media.” These ratings-likely respondents are not only great radio users, they’re the controllers of radio’s report cards – the most important customers that radio has to serve. If radio’s between-the-songs talent is great added value, we’d argue that talent has to be accessible and responsive. 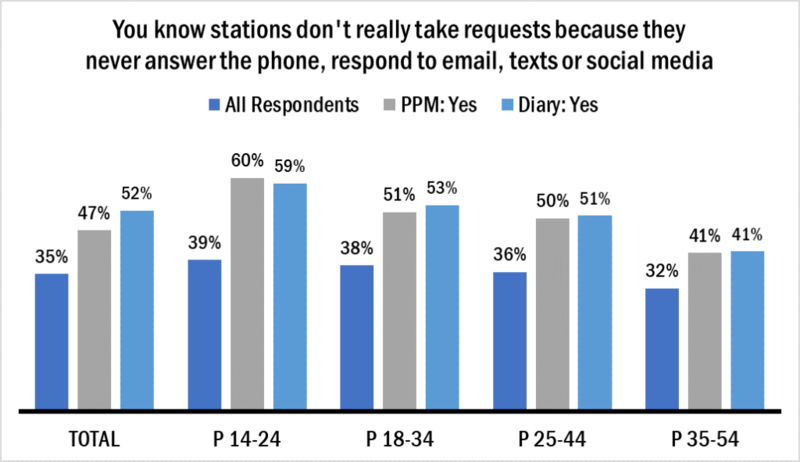 If your station isn’t easy to contact on the phone and responsive in email, text and social media, you’re missing out on opportunities to cement relationships with important listeners. Pretend you’re new to the area and try to find a phone number or email address for your station(s). Try calling the numbers or sending email to see what happens. Hopefully yours is one of those where the phones are answered and the communications are returned promptly. We’re coming down the home stretch this week with a few more showings of our latest webinar, How to Play & Win the Ratings Game. In it we have fresh numbers on Social Media usage, including numbers on whether or not users trust Social Media platforms with their personal data. We’ve got updated information on Smart Speakers: who’s got them, uses they’re serving in homes – and the potent question of whether or not that includes listening to FM. And we’ve got the latest data on the marketing channels most likely to impact those within Nielsen samples. Details and registration at nuvoodoo.com/webinars. A Game Show at an Industry Event? !